Replacing a spa pump impeller involves opening up the pump wet end. Typically a pump seal kit may be replaced at the same time to avoid leaks. Installing an impeller involves holding the pump shaft from the motor end with a flat screwdriver or tool while hand-threading on the impeller to the shaft. If the old impeller will not unthread, techs may use large Channel locks or pliers to get the old impeller off of the pump motor shaft by rotating it counter-clockwise. 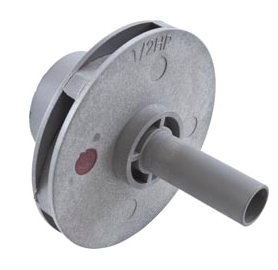 SEE our wide selection of Spa Pump Impellers. Sourcing the right impeller is important as they are unique to a particular pump wet end and horsepower rating of the wet end. The pump impeller horsepower ratings usually match the full rating of the motor horsepower. It is highly recommended to change out the shaft seal kit when replacing the impeller. Pump impeller blades can be sharp, so this type of work is best performed by spa technicians or skilled DIY individuals. In any case, pump work should not be performed on the spa pump if power is connected to the pump. Always disconnect power and turn off spa before performing this type of electrical work. 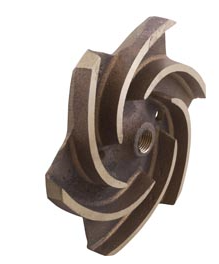 Impellers can be replaced in select AquaFlo, Waterway, Balboa, Hayward, Pentair, Vico, Jacuzzi, Watkins, Laing,Acura and other pump wet end models. Once the old impeller has been removed, the tech will inspect the motor shaft for straightness and also to remove any built up rust or debris. Impeller dimensions are sometimes provided to help match up the right part. 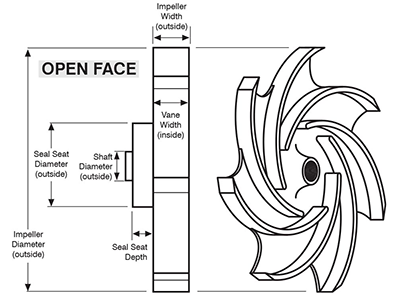 The above impeller type shows a Closed Face Impeller. Knowing the manufacturer and part number of the actual wet end makes it much easier to source an impeller for a particular wet end. If the brand/model wet end is not known, then providing the spa manufacturer name and spa model along with model year may provide some clues as to which pumps were used in a particular model year. 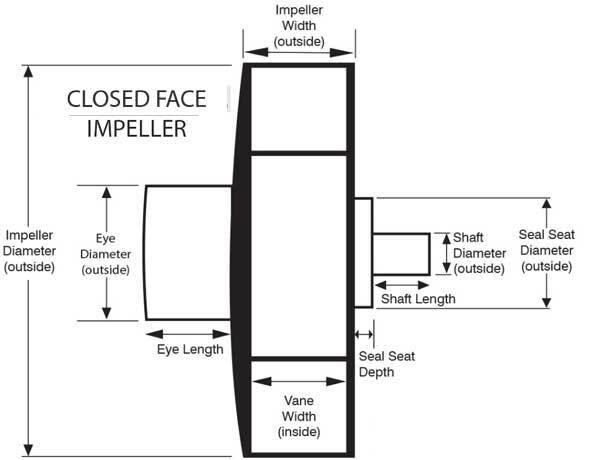 Otherwise, the raw data of an impeller can include impeller type (open or closed face as shown above), impeller outer diameter, vane width ID, eye diameter OD, eye length, impeller width OD, seal seat depth, shaft length, shaft diameter OD, seal seat diameter OD and of course the pump/wet end manufacturer and model. Sometimes it is better to replace the complete wet end, but the individual parts such as seal kit, impeller and orings are usually readily available for most current models and brands.